Mr Vanterpool penned a letter on March 5, 2019 to the Clerk of the HoA asking not to be sworn in as a member on March 12, 2019 and to resign from representing the Fourth District, after winning at the polls on February 25, 2019. At the time there was no Speaker of the HoA; however, when a speaker was in place from March 12, 2019 Mr. Vanterpool’s letter was turned over to Hon Willock, the new Speaker, by the Clerk. Mr Willock then accepted Mr Vanterpool’s letter of resignation. However, the Attorney General later advised Mr Vanterpool that his letter of resignation written to the Clerk was invalid as per Sec 67 (3) as it was not written to the Speaker. After receiving the Speaker’s resignation acceptance letter, Mr Vanterpool wrote seeking to be sworn in based on the advice he had received by the Attorney General Mr Baba F. Aziz. 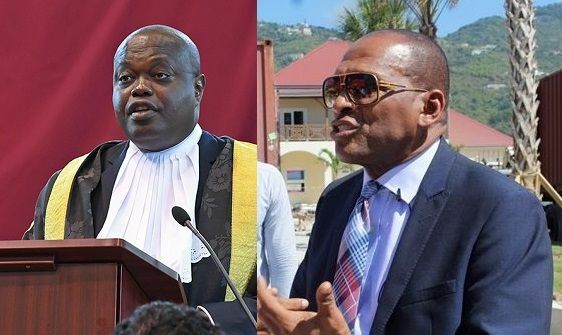 Many legal scholars have raised questions over the Attorney General advising Mr Vanterpool, the Speaker and His Excellency the Governor all on the same issue. The matter is expected to be heard on Friday April 12, 2019 in the High Court in Road Town; however, both sides have been tight-lipped as to who are the lawyers representing each side. A local online news site had reported that Speaker Willock has hired independent counsel; however, when reached he declined to comment. Former MCW Mark Vanterpool started this “Pappi Show” of the electoral process; he should end it. He intended to resign and behaviour demonstrated that he resigned. Having gained the most votes in D-4 in the Feb 25 general election, the Speaker position being vacant, he penned a resignation letter to the Clerk of HOA on March 05. Then supposedly on the misguided opinion by the AG Baba Aziz that his resignation letter was invalid, he recanted his resignation and wanted to be sworn in. The decision that the former MCW letter was invalid is pure nonsense. He intended to and had the right to resign. Should the Speaker’s position being vacant restrict a winner of a seat from resigning? No. The excuse of sending letter to the Clerk making the resignation invalid is just a red herring. IMO Baba Aziz provided poor advice. Now the learned jurists on the Supreme Court will have to settle the issue. The silver lining is that the checks and balances is working between Legislative/Executive and Judicial branches. no disrespect but the current Ag should be replaced: when NDP was the sitting administration the Ag would not give advise to the then opposition NOW sees it fit to give advise to mr pool....this same AG sat amidst the allegations of financial accountability and did Nothing!!!!! La la la la, we will see, the manmis back and aint a damn ting no obe can do about it! My boy practicing his court appearances? The Speaker is in charge of the House of Assembly. The letter, the public statement, the viral resignation video to all and sundry is enough evidence to seal the fate of the want to be member for the 4th electoral district. Enough is enough we want our country back.